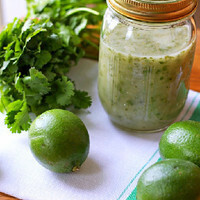 In a blender or food processor, combine lime juice, vinegar, garlic, salt, and sugar. Blend until well combined. With the food processor running, add in a slow stream of oil. Pulse in the cilantro. You want the cilantro to be well blended, but still be able to see plenty of flecks. Store in the fridge. Shake or stir well before serving. Made this try out with new salpicon de res recipe, and it is great! Added photo. Nice flavor components. I am a sucker for anything with cilantro. It's an herb you either love or hate. I love the smell as well as the flavor. When in season here in the Bay Area; 4 fresh bunches are less than $1.00. It has so many applications in various ethnic cuisines. Thanks for sharing!